Setting up a wedding registry is a fairly universal aspect of wedding planning. Wedding registries can be set up in almost any store for any number of items. Usually wedding registries allow couples to get whatever it is they need for their future home and life together. Perhaps there is some common ground for both the engaged couple and the wedding guests — how about an untraditional, alternative wedding registry?! Consider one of these four online wedding registry alternatives to free up gift options for you and your wedding guests. Honeyfund basically serves as a cash registry. Call it a honeymoon registry, a way to raise money for a downpayment, etc. — by letting your guests know what you’ll be using your cash for they’ll be more likely to support you. SimpleRegistry allows you to put all of your wish list items into one place. If you want a certain spatula from Macy’s but a crockpot from Sears you can put them both into one place. It saves you from having to decide what store to pick and allows your guests more freedom in where they shop. 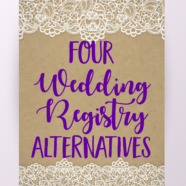 Card Avenue is your one-stop shop for wedding guests. Like using SimpleRegistry, you don’t have to limit yourself to only one store to set up a registry. Instead, let your guests save time by not having to track down a particular gift and gifting you a gift card instead. Gift cards don’t expire and then you can get what you want! If you want to find a gift that makes a fantastic gift option, Wedding Dress Preservation is a great idea. Every Bride wants to enjoy her gown for many years to come. Giving the gift of Wedding Dress Preservation makes that dream come true for her. Get an instant quote now. All wedding decisions are totally up to the bride and groom. The two of you need to determine whether or not a cash registry is socially acceptable or “proper wedding etiquette.” Consider the fact that it’s 2017 and it’s your wedding, your guests and your choice! 🙂 If you feel uncomfortable putting a cash registry on your wedding invitation, enlist members of your wedding party to get the information out via word-of-mouth. What do you think? Will you be exploring any of these wedding registry alternatives or sticking with something more traditional? Let us know on Facebook, Twitter, or in the comments!